We are David and Martina Burns, a husband and wife team, living in Co. Longford, Ireland. David, after completing his education in Gurteen College, Tipperary in 1977, began dairying on the family farm. Upon realizing that he did not have the acreage to continue expanding his dairy herd, he discontinued milking and turned his hand to maize sowing and contracting. This led to experimenting with sowing sweetcorn, and in 2012, David proudly received a EirGrid / Euro-Toques Food Award for his sweetcorn and "outstanding contribution to Irish food". Martina was a primary school principal until 2009. She has been making elderflower cordial for home use for years. David asked a few restaurant chefs to sample it and based on their reactions, and the encouragement of friends, the idea of commercial elderflower cordial production was born. After lots of tweaking, we finally decided on "Special Recipe No. 9". In January 2013, we took a leap of faith, formed a company, planted 920 elder saplings and are now producing small batches of award-winning elderflower cordial. In 2017, we planted a further 1,200 saplings. 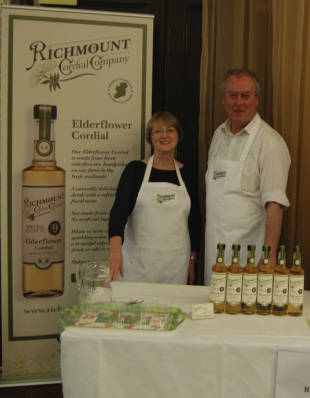 We hope you enjoy the light, refreshing taste of Richmount elderflowers.